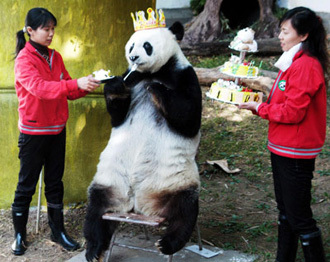 A birthday party was held yesterday for Basi, a 25-year-old giant panda that now lives at Panda World in east <?xml:namespace prefix = st1 ns = "urn:schemas-microsoft-com:office:smarttags" />China's Fujian Province. Basi was saved by a farmer in 1987 and was the inspiration for the mascot design for the 11th Asia Games, held in Beijing in 1990. Flowers, fruit, a huge cake and a tablet carved with the Chinese character "shou", meaning longevity, were some of the scrumptious spread to celebrate Basi's birthday. On Sunday, hundreds of visitors swarmed Panda World in east China's Fujian Province to join in the celebrations. A special birthday song was written for the occasion. The gentle giant walked around her pool before retreating into her cave to enjoy her cake in private. Basi is quite a celebrity in her own right, not least because of the dramatic fashion in which she was rescued. Li Xingyu, now 50, recalls how she rescued Basi in 1984 in Baoxing County, Sichuan Province. Li was tilling her fields by a small river when she saw an unconscious Basi floating downstream. Li pulled Basi out of the water and wrapped it in her jacket. Li brought her back to the village where villagers cared for her until she was taken to a professional breeding center. The giant panda was named after the Basi Creek, where she was saved. "I haven't seen Basi since I saved her," L said. "I'm so happy to be invited here to see her and celebrate her birthday. I have four children, but Basi is my fifth child, my little daughter," Li gushed. In 1987, Basi was loaned to a zoo in San Diego, the United States, for six months. Basi was what inspired the design of "Panpan," the mascot of the 11th Asia Games, held in Beijing in 1990. 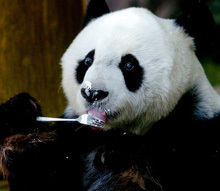 25 is a ripe old age for a giant panda, whose average life span is 12 years.